After a pretty respectable streak in the kitchen, I encountered an epic fail with the most unlikely of suspects: latkes, which don’t usually prove much of a challenge at all. 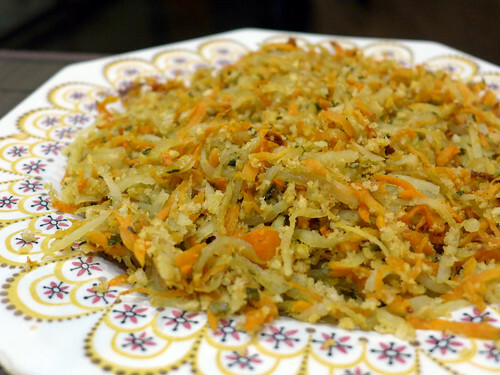 The Sweet Potato Latkes from Vegan Holiday Cooking – a 50/50 blend of shredded sweet and russet potatoes that looks so amazing in the gourmet food photo from the cookbook – came out more like hash browns. These guys could not hold a patty shape to save their lives. Like, not even close. I put a ball of batter in my palm to flatten it out, and it just crumbled everywhere. Not to mention, they didn’t even rival the neon orange color of the latkes pictured in the book. Not wishing to waste four potatoes (or all the effort spent grating them), I did the obvious thing: made them into baked hash browns! Basically I followed the alt. baking instructions, adding about 15 minutes to the recommended bake time. Since I needed two cookie sheets to hold all the potatoes, I tried a little experiment: the first cookie sheet I lined with parchment paper, while I lightly sprayed the other with Pam. The results? Nearly identical. Go figure. You’re supposed to top the mini latkes with a dab o’ almond creme fraiche – but, seeing as the recipe is so similar to the one featured in the Roasted Squash Soup – i.e., the one that already didn’t work for me once – I skipped it altogether. Good thing, since there were no latkes in need of garnishing after all! 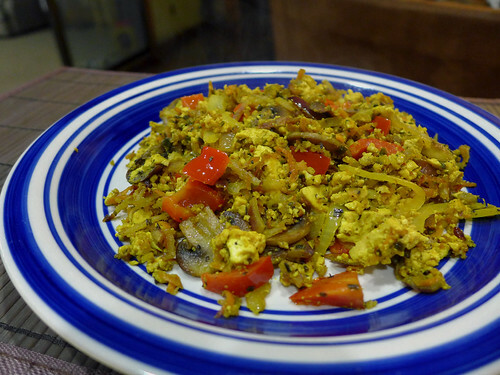 For what it’s worth, the leftover potatoes made a wonderful add-in for a tofu scramble. Pictured above is a scramble with mushrooms, onions, red peppers, tomatoes, and about a cup of hash browns (fried separately for maximum crispiness). So good, I’m not even 100% sure I can call this a fail. This entry was posted on Saturday, November 22nd, 2014 at 12:40 pm. You can follow any responses to this entry through the RSS 2.0 feed. You can leave a response, or trackback from your own site. Well, if you have to have a kitchen fail, at least it’s a delicious one! How often does that happen? No matter the form, potatoes are almost always a tasty addition.